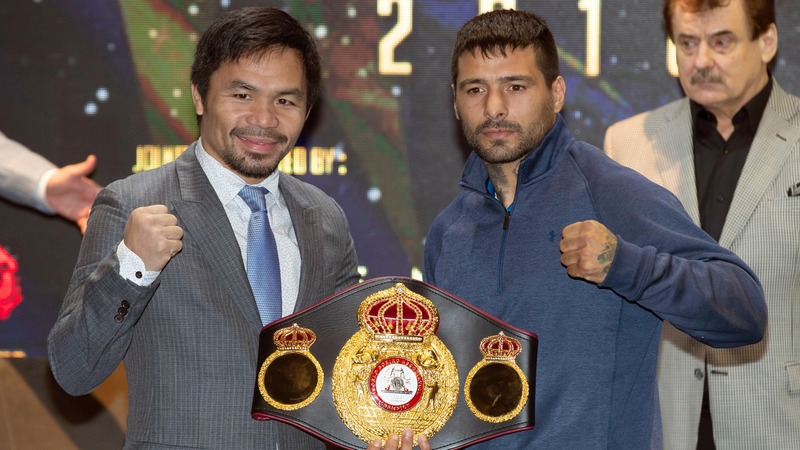 Financial uncertainty had the upcoming Manny Pacquiao-Lucas Matthysse fight for the WBA welterweight title in Kuala Lumpur, Malaysia, in doubt, but things have been squared away as of Tuesday. The money is on the table, so let's dance. Financial uncertainty had the upcoming Manny Pacquiao-Lucas Matthysse fight for the WBA welterweight title in doubt, but things have been squared away as of Tuesday, [according to ESPN](http://www.espn.com/boxing/story/_/id/23980524/manny-pacquiao-lucas-matthysse-fight-malaysia-go). The 39-year-old Pacquiao last fought a year ago, when he lost to Aussie Jeff Horn for his fourth defeat in his last nine fights dating back to 2012. He was 54-3-2 in his career up to the point. Still, Pacquiao (59-7-2, 38 KOs) is a -200 favorite, [as of Tuesday afternoon on BetOnline.ag](https://www.betonline.ag/sportsbook/boxing/matchups), for his July 15 fight (the 14th in America) at Axiata Arena in Kuala Lumpur, Malaysia, against the 35-year-old Matthysse (39-4, 36 KOs), who is the +170 underdog. A draw is 28/1 [on Oddschecker.com](https://www.oddschecker.com/boxing). The fight would have been called off had money from Pacquiao's promotion company not been received by Monday, one day prior to Matthysse and his team flying to Kuala Lumpur, Golden Boy Promotions president Eric Gomez told ESPN. Matthysse, who is promoted by Golden Boy, wanted to be in Malaysia two weeks prior to the fight to get used to the time difference, ESPN reported. "This is his dream fight," Gomez told ESPN about Matthysse. "It's the fight he's been talking about for five years now. Anytime you can fight a legend like Manny Pacquiao it's a win. "The money is in place ... and now everything is good. It's customary practice when you are fighting overseas to have the money in an escrow account, and now the money is there. We're excited to be working with Manny and his company, MP Promotions, and commend him for putting this fight together and making sure it comes off." MP Promotions "missed several deadlines over the past two months" to pay $2 million to the escrow account, according to the report. The fight will be broadcast on either ESPN or the company's streaming service, ESPN+.